For years we've had a food processor which has been underutilised simply because it takes up too much space in a small kitchen and was stored in a cupboard in the dining room where it was less accessible. 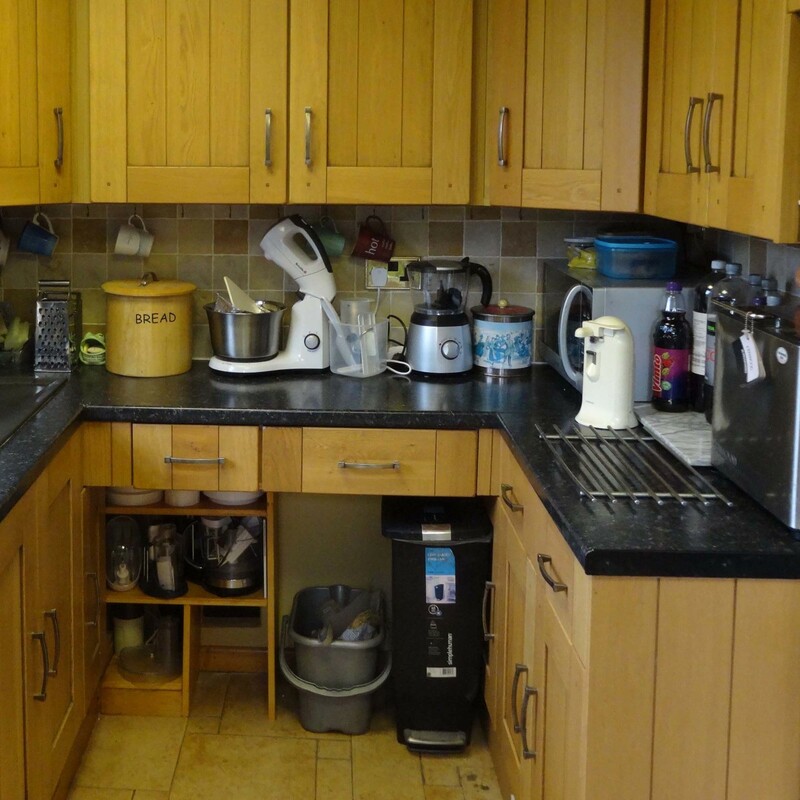 That was until I saw an opportunity to maximise on available space in the kitchen by building a storage area big enough to accommodate the food processor and all its attachments under our kitchen worktop at the far end of the kitchen. 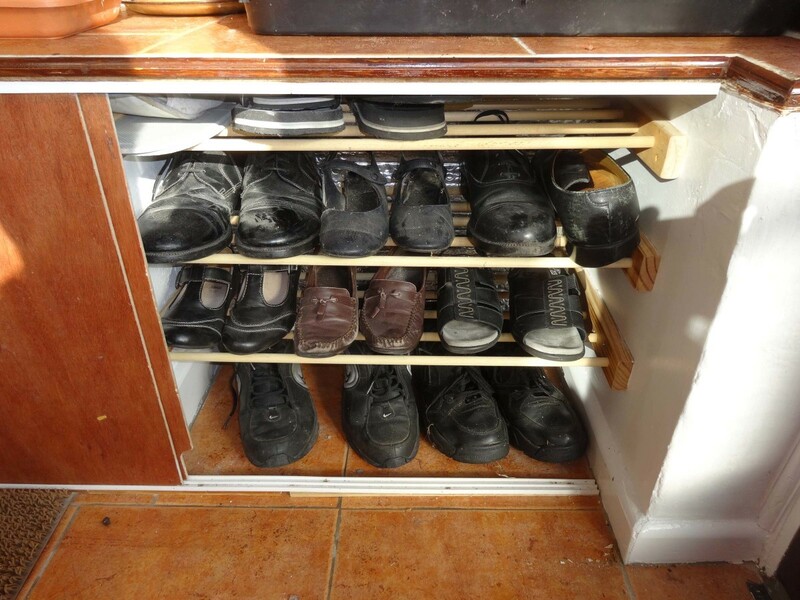 This DIY how-to project shows you step by step how I utilised this space to create a shelving unit for storing our food processor; and with some adaptation the idea could be modified as a space saving idea for you to build yourself similar shelving or cupboard space in any underutilised space in your kitchen. This pine shelving board is ¾ inch by 17 ¼ inch and 6 feet long, the ideal wood for shelving in this and other DIY shelving projects. For easy fix adjustable shelves, these shelf support brackets are similar to the ones I use in this and other DIY projects where adjustable shelves are required. 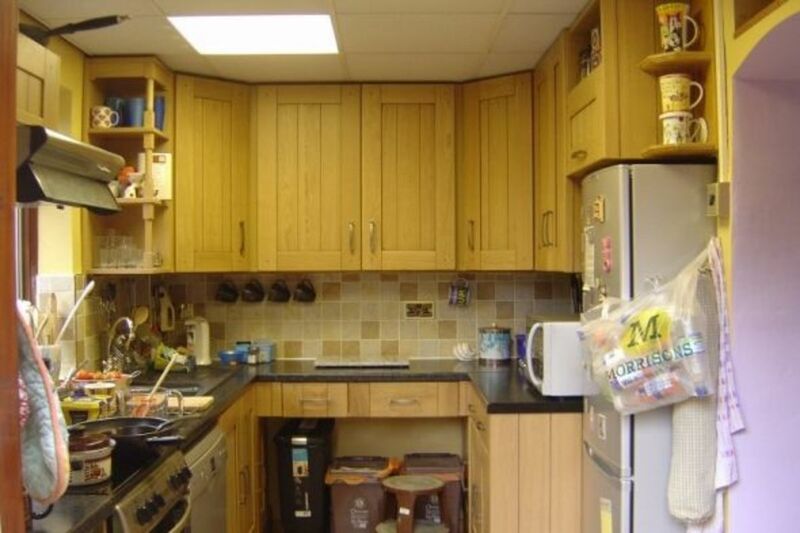 The reason we had open wasted space under our kitchen worktop, rather than having a fitted kitchen unit, was when I first designed and built the kitchen it was just after we were obliged by the council to recycle everything and we needed the space for all the recycle bins. 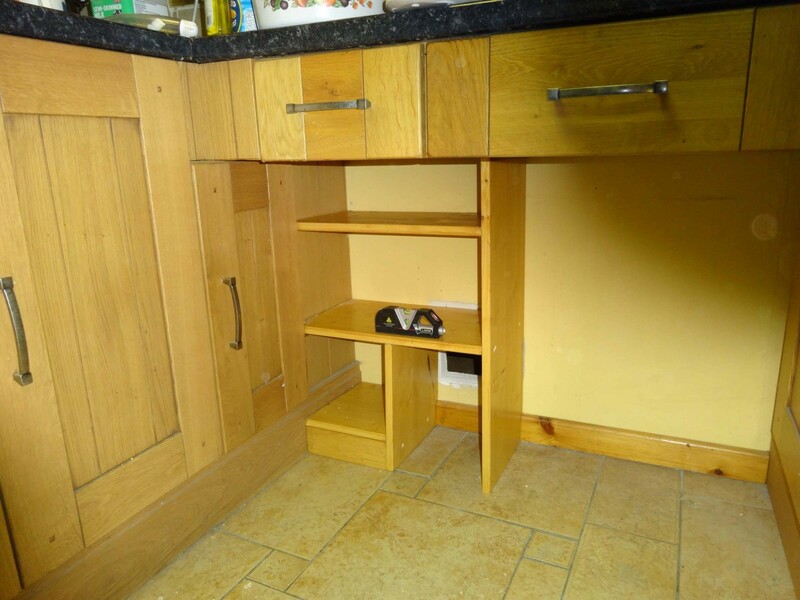 Therefore rather than fitting a kitchen unit there I bought two kitchen cupboards with top drawers and spliced the drawers from the units so that I could fit the drawers under a worktop and at right angles in the corners fit the bottom half of the cupboards. The kitchen base unit for the left side is smaller because the stopcock for the water supply into the house is located in that corner of the kitchen and rather than have access at the back of a kitchen cupboard, which is always awkward I blocked off that corner of the kitchen leaving access to the stopcock from the cloakroom on the other side of the room. 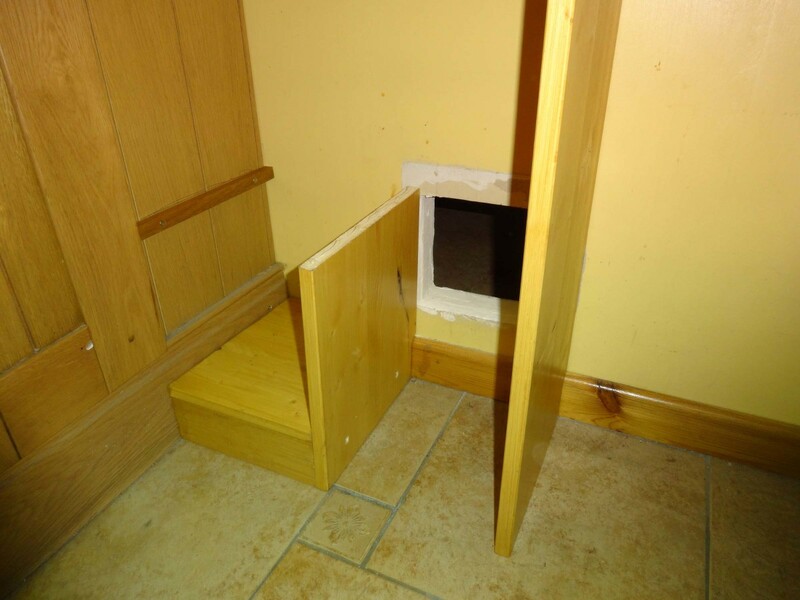 This solution conveniently gave us a recessed area in the cloakroom, where the stopcock is easily accessible when needed and which is just the right size for our cat litter tray to snuggly fit into. 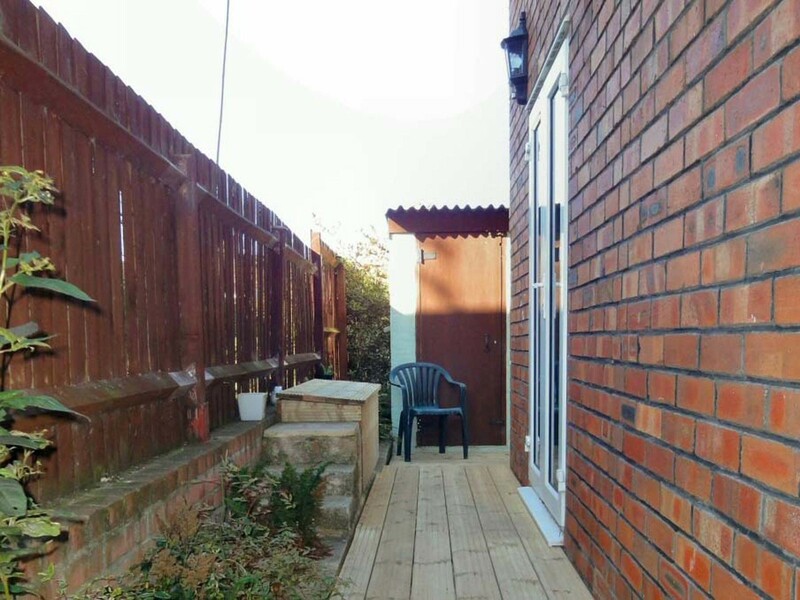 Since our original design to accommodate all the required recycle bins I have built one gigantic recycle bin using decking, just outside the kitchen back door, large enough for all the plastic recycle bins the local council gave us to comfortably fit inside. So now when we need to dispose of any recyclable material from the kitchen we just open the back door, lift the main recycle bin lid and pop the item to dispose of into the appropriate recycle bin; which can then be put out at the beginning of the week for the council to collect. Having moved the recycle bins outdoors has left us space that is just ideal for a space saving storage area. Space which is just big enough to fit shelving for storing our food processor in a convenient place in the kitchen; where it will be to hand and easily accessible when needed. 1. Moving recycle bins from the kitchen (where they got in the way) to the outside was a precursor to starting this project in that it left space under the kitchen worktop, part of which was just ideal for a bit of storage shelving. I was able to move the recycle bins outside (just outside the kitchen back door) by making a long storage box with a hinged lid from decking, large enough to store all the recycle bins safely. 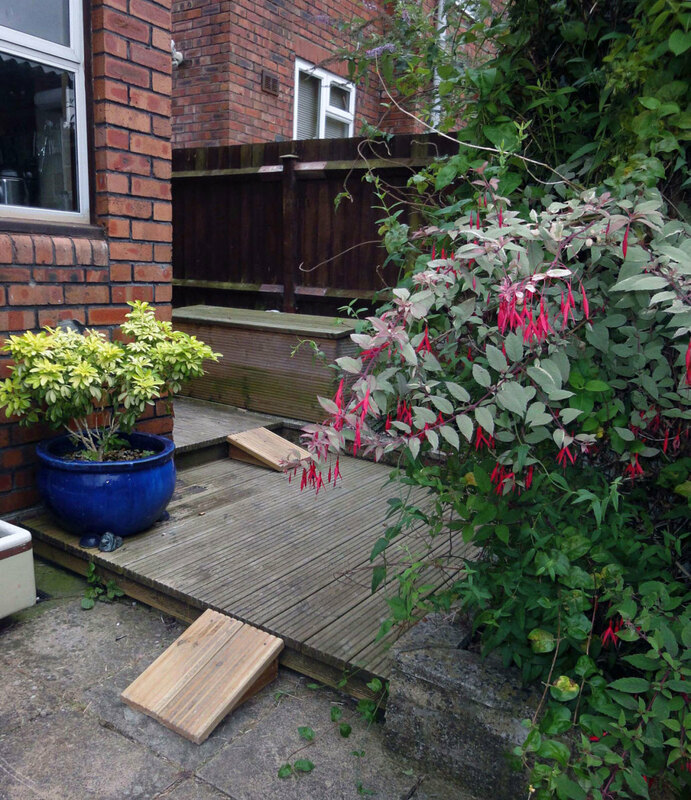 As can be seen in this photo, the recycle bins storage box is neatly tucked away behind our gossip step on the flower border alongside the side entrance path to our back garden. Because our road is on a slight gradient our property is almost three feet lower than our neighbours, and as we are on good terms with them building a gossip step just outside the back kitchen door so that we can talk to them over the garden fence was a convenient solution to the height difference preventing us from chatting to them in this way. Side entrance to our house with the wooden recycle bin just outside our kitchen back door. 2. 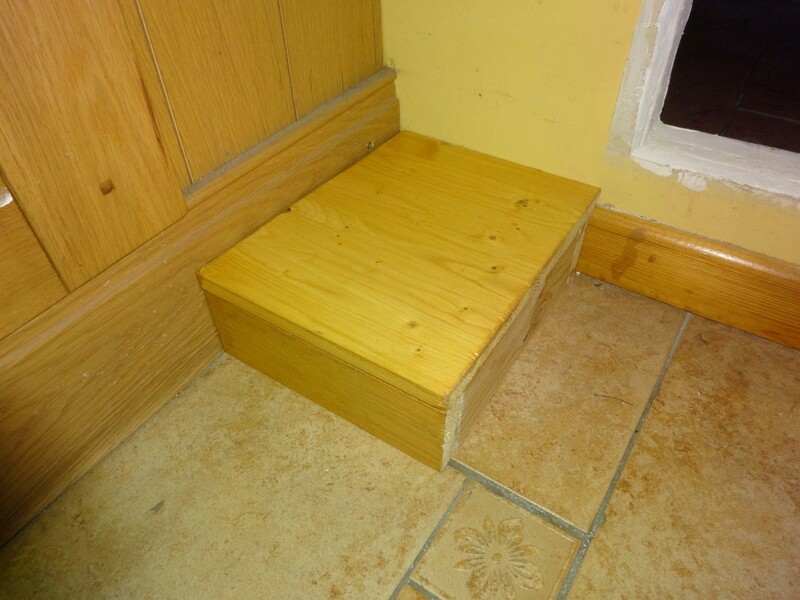 Having removed the recycle bins to the outside, all that was left in the space was the general waste bin (for non-recyclable kitchen waste) and a hidey-hole for our dalek (step stool) which for short people we find extremely useful for reaching the top shelves in the kitchen wall units. 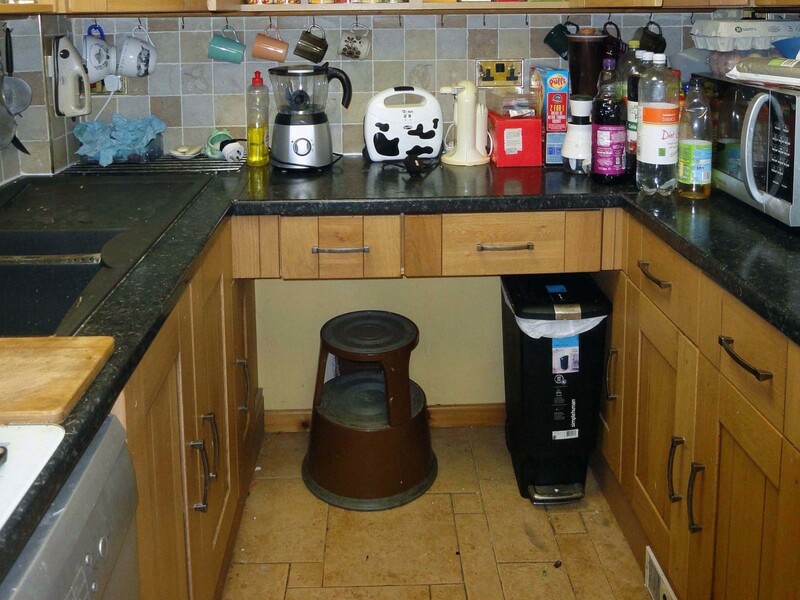 The dalek stool gets moved around the kitchen as necessary so it is not its permanent home, and the waste bin (which is on wheels) sits next to a corner cupboard, for which clearance needs to be kept to be able to open the door when access to the cupboard is required. Obviously, items that are not frequently used are stored in this cupboard. On the other side the cupboard (which is not as wide) is not right in the corner as that is where the stopcock is for the water supply to the house; access to the stopcock being from a conveniently accessible recess in our cloakroom on the other side of the kitchen wall. 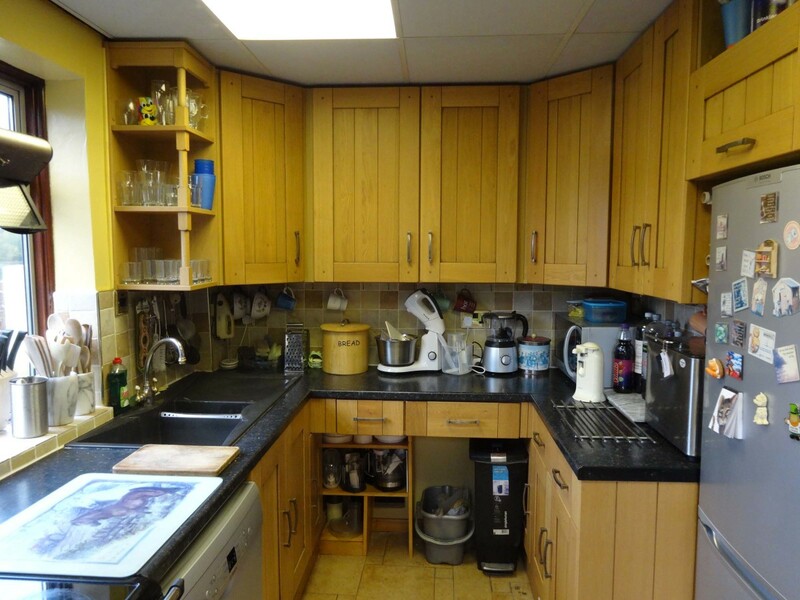 The distance from the end of this second cupboard to the back wall is almost 11 inches, which is more than wide enough for some useful shelving on that side of the space under the kitchen worktop. 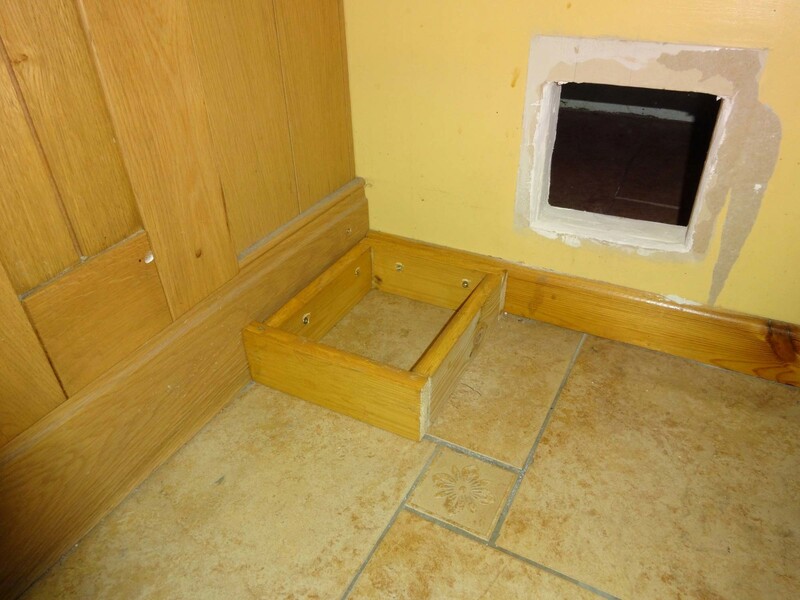 The only other consideration in my design was to accommodate the cat’s access hole from the cloakroom (where we feed them) to the kitchen. When I designed this kitchen a few years ago I bought the two corner cupboards with drawers, which I cut off the top to refit under the kitchen worktop as a convenient solution to maximising on drawer space. It is around these limitations that my design for creating shelving to conveniently store our food processor (so it is easy to hand when required) is based; as described in the rest of this DIY how-to project. Kitchen worktop with open space below. 3. As will be seen in the previous photo, there is the usual skirting board which the sides for any shelving unit or other built-in fitted furniture have to fit around. 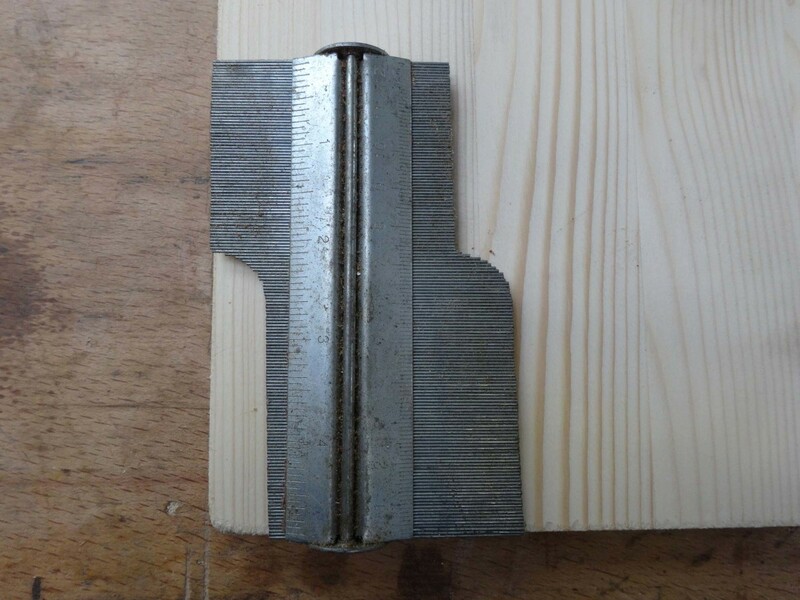 Cutting the profile accurately for skirting board is almost impossible unless you have a piece of off-cut to use as a template or, as I did, use a profile gauge, as shown in this image. The two pieces I needed this for being the side supports either side of the cat access to the kitchen. Using a profile gauge to markout and cut the wood to fit the skirtingboard. 4. Before cutting all the other pieces (the shelves) I made a small plinth that the bottom shelf would sit on. A simple box construction that was tested for fit before gluing and screwing. 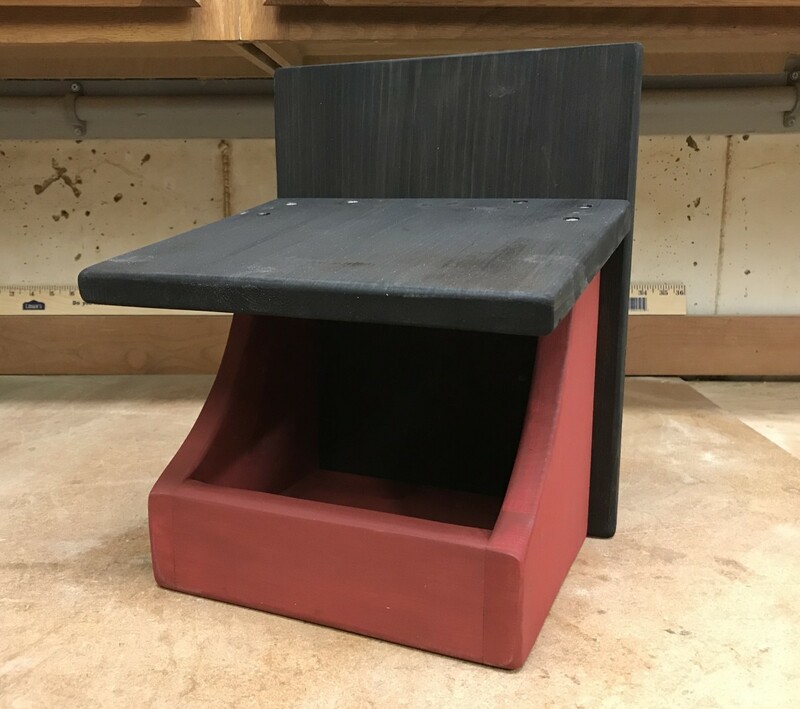 The advantages of making the plinth as a box is that it makes a solid unit that the inner side panel can be securely fixed to making it rigid which in turn helps to make the rest of the shelving unit more rigid. As the front piece is the full width of the boxed plinth I could have used wooden blocks from the inside corners to conceal the fixing screws, but on this occasion as there would be no lateral stresses on the plinth I decided to pin the front in place (until the wood glue is set) with a nail gun that uses thin gauge pins which are invisible to the naked eye. Making the boxed base for the built in shelving. 5. 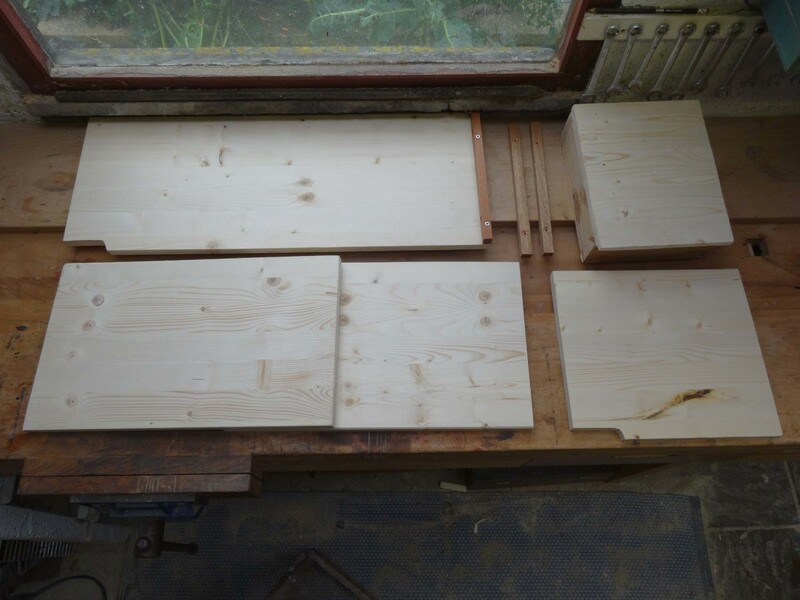 Having made the plinth and cut the two side panels to size, all made with pine board, the next step was to measure and cut the rest of the wood. 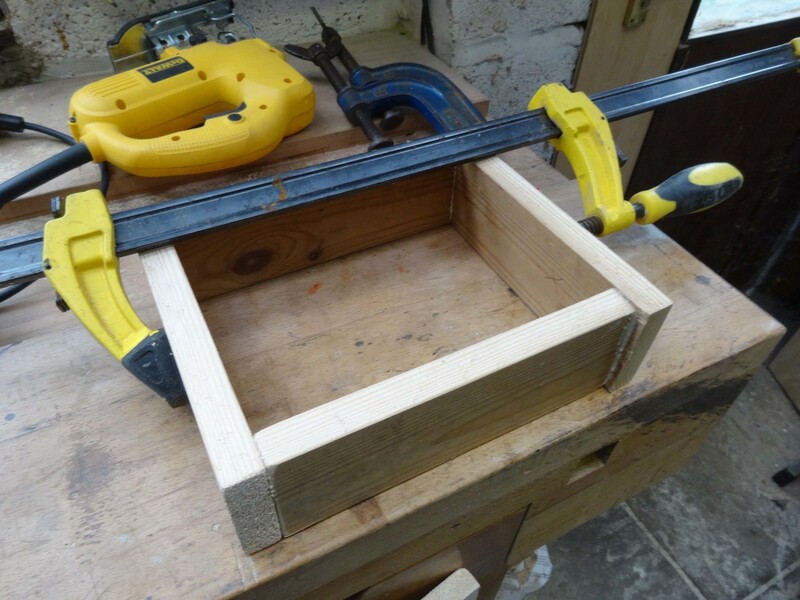 The three shelves to size, the batten for supporting the main side support to the underside of the support for the two drawers under the kitchen worktop and the other two battens to be used for fixing the middle shelf. All the pieces of wood for the shelving cut to size and ready for assembling. 6. Once all the pieces are cut it is advisable to test fit all the piece in situ (without screwing) and making any final adjustments before sanding smooth and rounding off all the edges prior to painting, staining or varnishing. 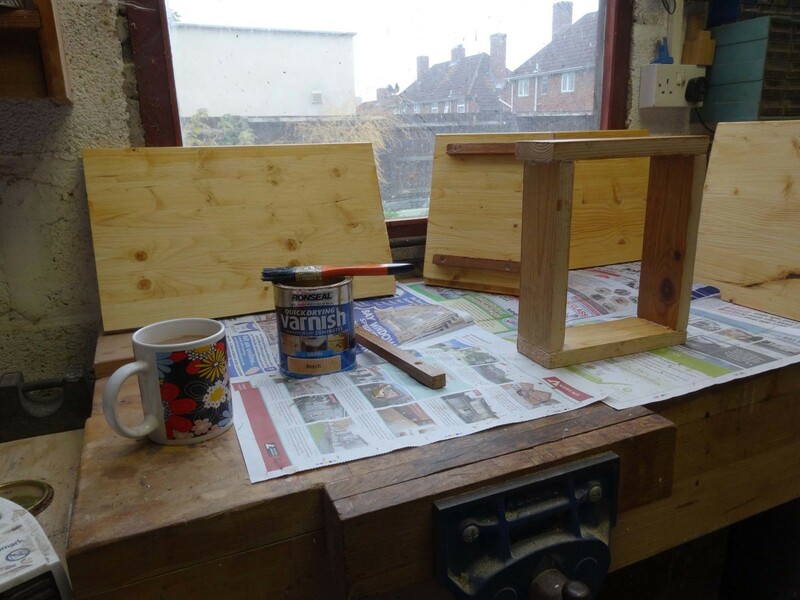 It is easier to paint, wood stain or varnish before final fit. In my case I varnished all the wood with two coats of oak effect varnish which closely matches the oak wood of the doors and drawers in our kitchen units. I used a quick drying yacht varnish which is tough and waterproof making it ideal for use in the kitchen. Then sat back with a cup of coffee or two while the varnished dried between coats (one hour) before final assembly and fit. Varnishing all the shelving prior to assembling. 7. Although the middle shelf is fixed solidly in position for added stability and strength, I used shelf support for the top shelf as future proofing in that although the shelving unit has been designed specifically to house our food processor and all its accessories we have the option to lower or higher the top shelf to accommodate any future change in use. These are simply fitted by pre-drilling support holes at equal height near the four edges under where the shelf will sit. The holes being fractionally smaller than the diameter of the shelf support fitting; see the video below for further tips of fitting shelf supports. 8. With all the pieces now cut to size and varnished, the first step to fitting the shelving unit is placing the plinth position and securely fixing it from the inside to the skirting board and kitchen cupboard plinth with a few screws. As you will notice from this photo the bottom shelf is quite small to avoid blocking the access hole into the kitchen for our cats. Screwing the base into place. 9. The bottom shelf just simply sits on the plinth. You could glue and screw it down but I did not as once the inner side panel is in fitted this base shelf is such a fit that it is not going anywhere; and optimally, with some effort I do have the option of prising it open as a hidey-hole, although I doubt I will ever use it for such a purpose. Adding the top to the base. 10. The two side panels go up next, the inner one being firmly screwed to the plinth and the main one being fixed with a batten under the support for the drawers fitted under the kitchen worktop. Although the bottom of the main side support is not fixed into place, once the middle is fitted it will lock this side panel solid. Fixing the shelving side pieces in place. 11. 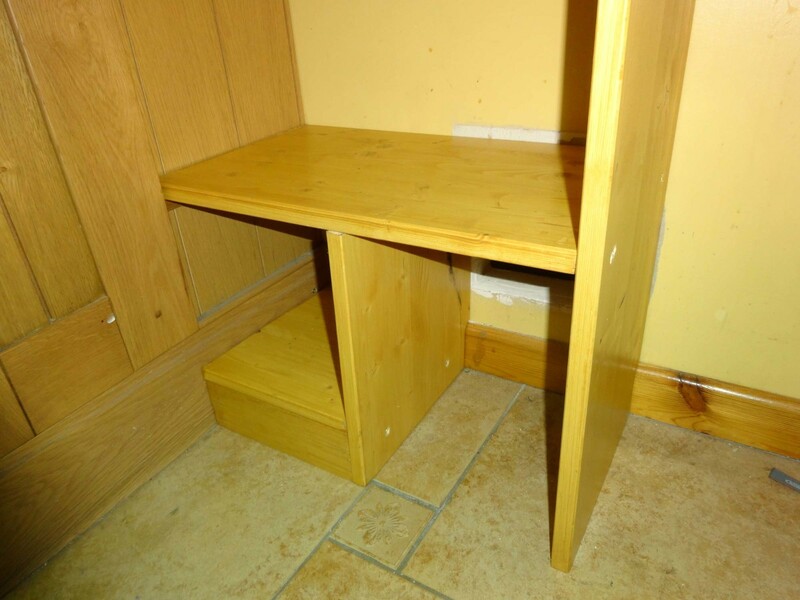 Using two battens, the middle shelf is firmly fixed to the main side support with glue and screws, and glued and pinned into position on the other side using a nail gun and small gauge pins. And glued and pinned to the middle shelf support to secure that solidly. This arrangement, while maximising on usage of available space also maintains full access for our cats from their feeding room in our cloakroom to the kitchen. Adding the bottom fixed shelf. 12. Almost complete, checking levels with a spirit level for each shelf as it is fitted and, using metal shelf supports, fitting the top shelf. Once I am satisfied that everything is straight and level, and firmly fitted it is just a case of touching up the odd spot e.g. 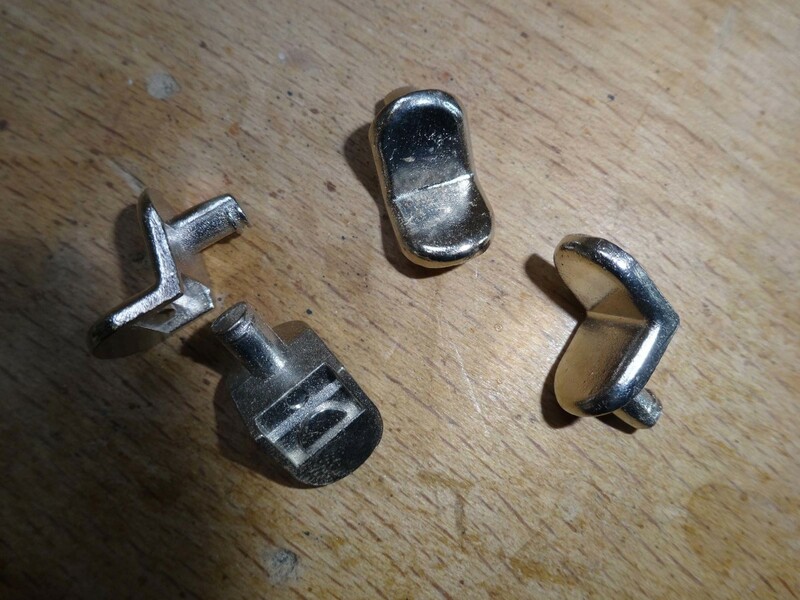 screw holes with a bit of varnish, and once dry giving it all a good wipe down and clean up with a damp cloth before use. 13. On completion we could then relocate our food processor and all its accessories to the new shelving in the kitchen where it is to hand in a convenient place for easy access and use. This in turn freed-up valuable cupboard storage space in our dining room which has subsequently been put to better use. The pedal waste bin just slides back into position next to the new shelving and which can be easily pulled-out when we want access to the corner cupboard on that side. 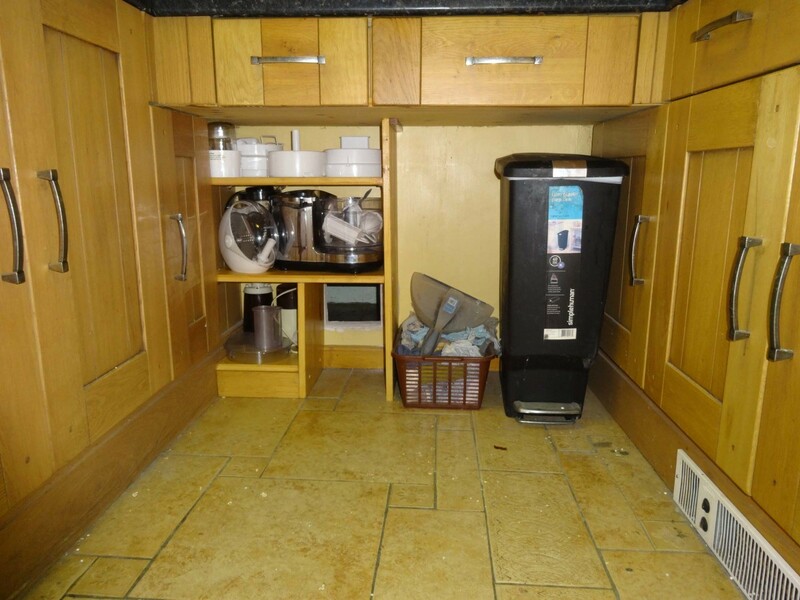 The remaining space needed for door clearance for the kitchen unit is a handy space to put a basket with a few bits and pieces in; no doubt we may better utilise the space later if we think of any good alternative uses. Open shelving fitted into place under the kitchen worktop. 14. And a wider view of how it all fits into context; one option, rather than open shelves, would have been to fit a door or a pair of doors on the front to enclose it and match it in with the rest of the kitchen. However, for its location doors would have been a hindrance making access to our food processor more difficult and thereby making it less likely to get used for tasks which can be done almost as easily by hand or by using other kitchen appliance. View of the whole kitchen with the new open shelving fitted. 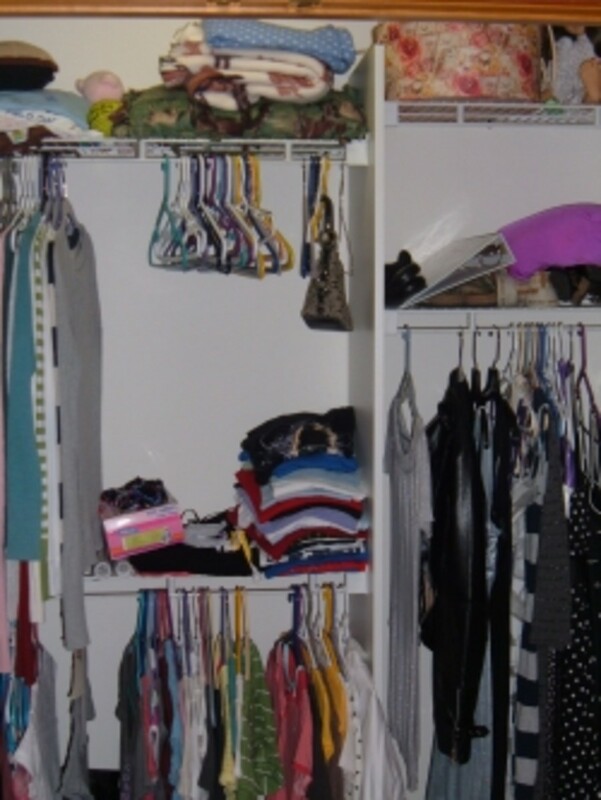 Making adjustable shelves where possible is a good way of future proofing your shelf design so that their height can easily and quickly be adjust to fit your new storage requirements e.g. changing shelves for storing CDs rather than paperback books. This video, made by me as a demo for a previous DIY project, provides some useful tips in making adjustable shelving. 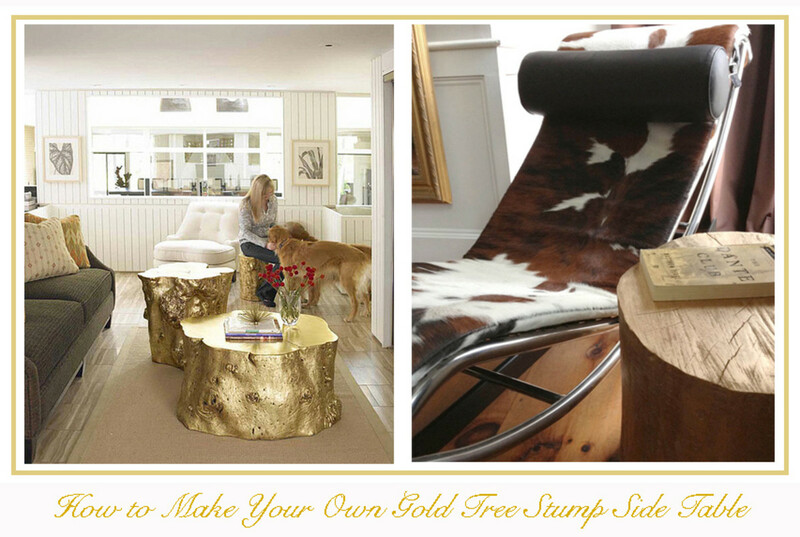 Thanks owenrush, I’m always looking for innovative ideas for DIY around the home; so you never know. you have just done awesome hope you're going to amazed us with your top class idea soon. Another great idea here. I love how handy you are! Your lens on the plinth drawers is one of my favorites! It's good to see ideas that make use of space like this.